Posted on April 25, 2015, in humor and tagged Bible, Inspiration, π, Lawrence Krauss, meme. Bookmark the permalink. 9 Comments. Although I don’t think it justifies mocking scripture, I do think it legitimately surve as counter-evidence against the inspiration of scripture. I think this can be most intuitively represented by a method you have presented in debates against beliefs of mine. 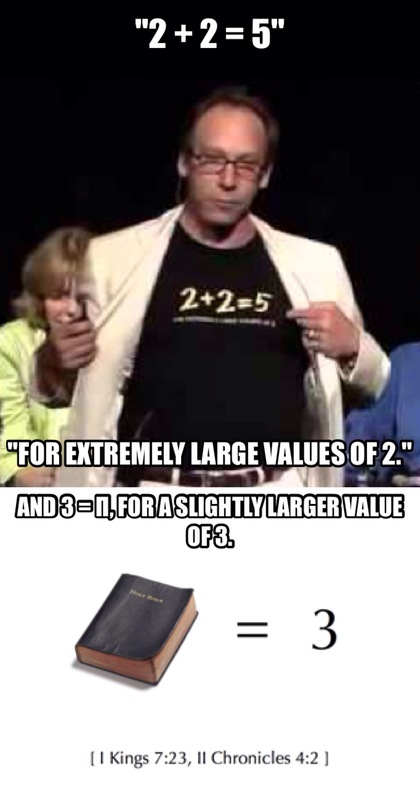 Imagine that pi was represented in that passage of scripture to a remarkable and anachronistic degree (obviously could not be presented perfectly being an irrational number)… Would that surve as evidence FOR at the very least a very intelligent non-human source of such a scriptural passage? I.e. In favor of inspiration? If so, than the lack seems like evidence against divine inspiration (especially in combination with a divine hideness argument). I would agree that, had scriptures stated that there is a constant ratio between circumference and diameter across all Euclidean circles prior to its discovery by Mathematicians, it would count as some sort of evidence in favor of inspiration. The absence of such evidence obviously doesn’t diminish the prior probability of the inspiration of scripture. However, I am not really sure a coherent evidential case for Biblical inspiration can be made. I take it more as a matter of faith, where as I think belief in God can be backed on evidential and philosophical grounds. I do think it is a little disingenuous to complain “why would God include such things,” that we can figure out such things for ourself, etc. … God found time and space to include precise dimensions and descriptions of how to build the tabernacle, hem and pattern religious garments and temple shrouds, where precisely priests should place the sacrificial blood of animals, how much of the offering those priests’ should receive, advice on not placing alters at an angle so as not to peer up priestly garments, questionable advice on ridding oneself of skin ailments and domiciles’ mold, or washing one’s hands, etc. (and these are just off the top of my head)… But a little geometric revelation or any kind of very surprising and precise culturally anachronistic information was out of bounds? Or God was just TOO busy with those many other important inspirational facts (which apparently we are incapable of discovering without revelation)? It’s not that God is too busy, but that revelation has to do with the way God relates to his people. All other such things, including sanitation rules were all set with the context of revealing God’s holiness and his call to a people to also be holy (set apart). Sure, geometric revelations would be impressive, but I don’t think revelation is about wowing us with trivia. I don’t think God is under any moral obligation to reveal things that we can figure out on our own. In fact, I think it would be counter to our end as intellectual beings to create us with a capacity and deny us the satisfaction of realizing it to its fullest potential. Perhaps you see this as my attempt to ad hoc rationalize away the force of this argument, but I’m telling you that I really don’t know of any Jew or Christian who would be terribly troubled by this. “Why would God spend pages explaining geometric and arithmetic relations when he gave us the intelligence to do these things ourselves?” ——- So why tell us anything? There are truths that can be known by natural reason (scientific and mathematical truths), and there are truths that can only be known by revelation (who is God, who is Christ, what must I do to be saved). Truths that can only be known by revelation that are necessary for our salvation need to be given to us. Truths that we can figure out by rolling up our selves and doing some hard thinking should not be given away just because thinking is hard. There is no error in the description, people just don’t read it right. The total diameter including the brim is 10 cubits, but the tank part of it is less than that, with a circumference of 30 cubits. Indeed, I don’t think there is any plausible reading of that passage other than as a physical description of a physical object. It doesn’t teach anything about the relationship between circumferences and diameters of Euclidean circles.